1. International lingerie and fashion icon La Perla opens first Australian store in Sydney. 2. Singer Rihanna sues Topshop for using her image on clothing. 3. McDonalds plans massive expansion in China. 4. PayPal says Gold Coast and Hinterland is top source of small-medium online businesses. 5. Electric car-maker, Tesla, changes automotive retailing by opening car shops in shopping centres. 6. Radio Rentals reports record installations and earnings. 7. Myer reports slight rise in earnings making 4 consecutive quarters of improvement. 8. Apple to open first Adelaide store. 9. Westfield in talks to sell several US malls. 10. Myer plans its biggest ever stocktake sale. 11. Westpac Consumer Sentiment Index records 7% drop in May. 12. Dulux pulls paint range from Masters as store aligns more with US paint brands. 13. Clothing retailer, Gap Inc., reports 43% increase in first quarter earnings as turnaround continues. 14. Ralph Lauren reports 4th quarter profit increase. 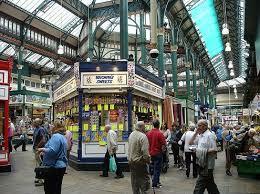 Market renewal is well underway in England as authorities tackle the declining fortune of traditional markets. Markets are seen as an essential ingredient of English community life and the lessons learned through the renewal process could bear heavily on our own Queen Victoria Market renewal process. Leeds, Kirkgate Market has been in the news recently with a plan from Leeds Council to inject 12.3 million pounds into developing the market. This market has some similarities with QVM in that it was initially completed in 1857 and has suffered recent decline with traders blaming lack of investment and marketing, and high rents for a general run-down in conditions. Kirkgate has been the subject of several high profile public consultations as the Council’s Executive Board plan for works commencing this year and being completed by 2016. 1. Creation of a flexible central events and entertainment space. 2. New routes through the market. 3. Creating distinct zones to encourage customers to travel to all areas of the market. 5. A daily indoor market where traders could set up for just one day. 6. New retail units linking with another retail development across the road. 7. Improving the interior and exterior of the market making it both attractive and easily accessible. 8. Reducing some rents in order to attract new entrepreneurial traders. 1. There are no plans to gentrify the market. 2. No trader would have to move more than once during the development phase. 3. The stall content is not driven by the council. Traders set up according to demand. 4. An initial idea to reduce the size of the market by one quarter has been rejected. 5. The number of stalls would remain roughly the same, and in fact may increase. 6. Rents had been kept at the same level for the last 5 years and there were no plans to increase them. 7.The project includes a new management structure involving traders from different parts of the market. Today Tonight has reported that Chinese tourists are being ripped off as cut price tour operators reclaim their profits through overpriced shop sales. Australia's biggest spending tourists are not being treated like welcome visitors but herded around and ripped off instead. A funeral service was held today at Springvale Cemetery for trader Michael Presser. Michael passed away this week after being rushed to hospital last Saturday. At today’s funeral service the Rabbi talked of Michael Presser’s passion and commitment to his family and his religion. This came as no surprise to the traders who attended the service because these were certainly qualities he displayed as a Trader and a Traders Representative at QVM. Few people exhibit the sort of passion that Michael had for his beloved market and even fewer understand the essential ingredient of the market’s existence. As far back as the 2002 QVM Master Plan submissions, Michael was writing that the market was not its buildings and alleyways - it was not the market management or the City Council - it was the market traders. It was the traders who provided the core reason for the market’s existence (a place of business) and who added the intimacy, excitement, and entrepreneurial spirit that kept customers coming back. He was passionate about empowering traders and letting them determine a bright future through commercial freedom. Michael was a powerful character and argued his point of view quite forcefully. 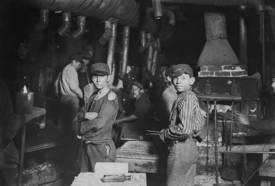 In various aspects of his life he applied the role of teacher. Michael asked that we reject the concept of market re-development and embrace “renewal” and “restoration”. Some may think that this is playing with words but renewal and restoration imply retaining the ingredients that are at the heart of an organisation and then carefully considering how to make them better. This view could be one of Michael’s more important legacies as we move forward. We have received reports that Michael Presser has passed away after being admitted to hospital over the weekend. Michael made a significant contribution to the market as a representative of traders both on the TAC and as President of the Queen Victoria Market Trader's Association. He played a pivotal role in some of the major issues involving traders over the last 20 years and will be sorely missed. Our sincere condolences to Robyn and family. Below is a link to a video that examines hi-tech analysis of customer in-store behaviour and makes some interesting observations about small business. 23/05/2013 16:27:19 Classified Advertising "FOR SALE - Alby from E Shed has a quantity of Mesh Wire display grids, mainly black some white for sale. $20,00 each if anyone is interested. Good for displays. 1. Discount Superstores (Crazy Clark's) to close Tullarmarine distribution centre plus some suburban stores. 2. National Retailers Association says little in budget for shopkeepers. 3. Major retailers (Marks & Spencer, Zara, Benetton, Calvin Klein) sign agreement to improve conditions and safety in Bangladesh factories. 4. China's industrial production up 9.3% in April. 5. Fashion designer and retailer, Lisa Ho, calls in administrators. 6. J.C.Penney launches ad campaign apologising for changes made by previous CEO. 7. Westpac records 10% increase in cash profit to 31st March. 8. Wesfarmers issues profit warning for Target department stores. 9. Spain announces first monthly trade surplus since 1971. 10. Australian dollar declines as confidence in US economy improves. 11. Customs charges for imports over $10,000 to rise by 50%. 12. Reject Shop picks up 6 Chickenfeed shops in Queensland. 13. Westfield report rents on new leases dropped 4.9% in first quarter. 14. 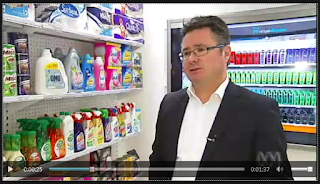 Supermarkets voluntary code of conduct yet to be embraced by Aldi, Metcash, or Costco. 15. Australian fitness wear chain, Lorna Jane, targets UK with its first regional online store. 16. Guardian Pharmacy wins sector award for best customer service. 17. 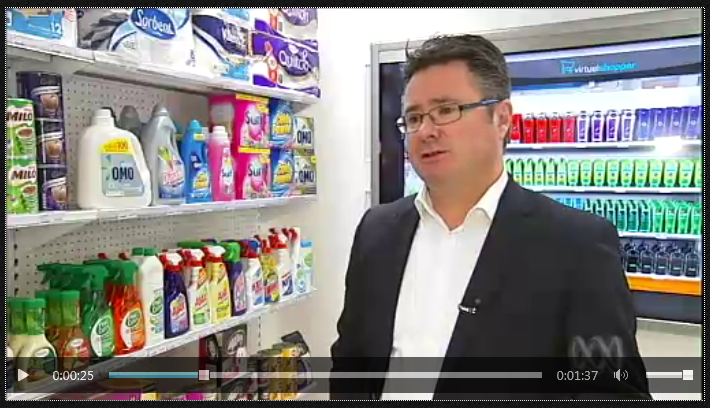 Woolworths launches first airport grocery collection service to help arriving travellers. Although food is not the main game in the General Merchandise area of QVM, food is obviously an essential ingredient in this market’s make-up. So when a competitor takes another little bit of our turf, we take notice. Woolworths has just announced a grocery pick-up service for Melbourne Airport. The idea is that weary travellers can pick-up their essential food items without having to stop off on the way home. It is all about convenience for the customer and makes it easier to avoid the empty pantry syndrome. Customers order via an app on their mobile phone and their food is ready for collection on arrival at Melbourne Airport. Sounds like a great idea and the sort of thinking that could enhance the traditional food offering at QVM. 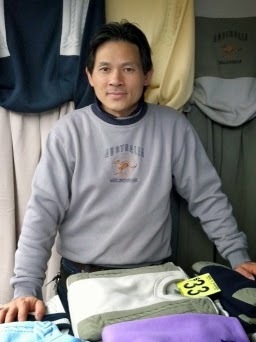 If you want a master class in customer relations visit Kha Nguyen at his clothing stall. Kha has a low key service approach where he engages with the customer without being too intrusive. He constantly watches for body language indications that the customer might need some assistance but otherwise let's them go about their browsing. He gets the balance just right - letting the customer browse, but being constantly attentive to their needs. However his "killer" talent is his ability to laugh with the customer even when things get a little difficult. I was at Kha's stall last weekend and a husband and wife team were browsing with the wife giving Kha a bit of a hard time about pricing. Kha's tactic was to laugh off the customer's unreasonable request and, although I can't remember exactly what he said, I do remember the customer suddenly broadly smiling, obviously enjoying the exchange. Kha was polite, but firm, and above all, friendly and smiling. The sale turned into a two garment purchase and the customers left very happy. Getting the balance right with customers is not easy. They can be difficult and sometimes rude and demanding. But we can learn from traders like Kha. Give the right level of attention to your customer, be prepared to laugh and engage with them, and difficulties can be turned into sales. The Australian dollar has declined significantly over the past two weeks from around 103 US cents to 97 cents in recent days. The decline is caused by a number of factors including the relative strength of the Australian economy (particularly our resources sector), local interest rates, and the strength of our major trading partners. 1. Australian travellers will find it dearer to travel overseas - perhaps more will travel within Australia which could be good for tourist sites like QVM. 2. Overseas travellers will find it cheaper to come to Australia- which could be good for tourist sites like QVM. 3. Imported goods will be dearer. 4. Exported goods will be cheaper. Like most economic shifts there are winners and losers. Tourism is likely to be a winner in this case. How far is the dollar likely to fall? Some are predicting as low as 60 cents although general consensus seems to place fair value at around 75-80 cents. Warning - much of this article is based on economic speculation. 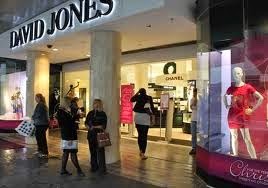 Department store, David Jones, has given suppliers 12 months to make their products globally competitive. DJ's say they have been very successful in reducing most prices to at least meet global standards but that suppliers who did not meet the new standards would find themselves on the outer. The department store has also announced successful signings of some suppliers from their arch rivals Myers (Givenchy, Pucci), and new lease negotiations which will see lease periods reduced from 25 years to 15 years. 1. Oxfam urges target, Big W, Just Group, and K-Mart to identify their sources of supply in wake of Bangladesh factory disaster. 2. NAB reports modest online retail sales growth in March. 3. March retail sales figures fall 0.4% with only Supermarkets and cafe/restaurant showing growth. 4. JB HiFi expect slight improvement in original sales and profit forecast for 2013. 5. Coles claims Coca-Cola too expensive in Australia. 7. Sydney Opera House opens up food & beverage outlets to public tender for first time. 8. Adidas reports strong sales in China while others struggle. 9. Lord Mayor Doyle calls on Federal Government to assist with financing $100m for QVM re-development. 10. Sydney extends its trial of night time food trucks claiming positive response. There was a suggestion in the Melbourne press during the week that the MCC budget for QVM included provision for market renewal. Our interpretation of the budget is that it contains pretty standard maintenance and replacement works provisions. Apart from provision of $100K to gain trader acceptance to a vision for the renewal project, there are no substantial "renewal" items. Here is the detail of how the 2013-14 Melbourne City Council Expenditure on QVM will be allocated. - Taken from the MCC website. The MCC's recent budget contains two measures that are a slap in the face for all city retailers. This week's Council Budget increased city street car parking fees from $4.00 to $5.50 per hour. While suburban and regional shopping centres continue to offer free parking for their customers, the ongoing increases from our city council can do little more than turn local shoppers away. In the same budget council announced that the free tourist shuttle bus would now be subject to a $5 per day fee for passengers over 9 years old. A free tourist shuttle makes a strong welcoming statement to Melbourne's tourists and could be seen as an important ingredient to customer mobility. It remains to be seen what impact a $5 fee will have on passenger numbers but it is fair to say that any reduction in tourist numbers will be a severe blow for QVM Traders in the top end. 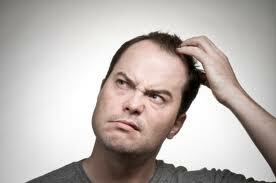 - Anybody else notice how recent Trader Bulletins contain less PR and more straight talk? A change for the good as far as we are concerned. - Rumour has it that cruise ship tours are bypassing QVM and heading straight for Harbour Town by arrangement with Mr. Doyle's mob. - Just one of the many issues in the top end is lighting. GM Traders have invested in a professional German made light meter to assist in evaluating lighting conditions. - It looks like our T-shirt man has departed from his container in String Bean Alley. - Apparently ARA Consultant, Victoria Niewalda, is no longer part of the management team. We will miss her professional creative approach to market issues. The Victorian State Government and Melbourne City Council budgets have been released in the past couple of days. The Victorian State Government budget made no mention of QVM (not that anything was necessarily expected) and the Melbourne City Council has dedicated $1.28 million for Queen Victoria Market renewal, replacement and improvement works. Mistakes You Don’t Want to Make in Selecting a Business Name. The Queen Victoria Market has a very high proportion of un-named businesses. Well, technically all our businesses have some sort of name but here we are talking about a name that we can promote to customers. 1. Don’t pick a name that is only relevant to you. Sure, it is very tempting to leave your mark on the business world with a personally motivating business name, but if it doesn’t make sense to others, it won’t help your business develop. 2. Using personal or family names are fine if you don’t want to sell your business. A branded name on the other hand can add value to your business when you decide to sell. 3. No matter how great the name sounds, if it has an unsavoury connection with something bad or perhaps has a different meaning in another language, you could regret its choice. Do a comprehensive web search before deciding. 4. Avoid names that are difficult to spell or pronounce. Some large companies have been forced to spend a lot of money making their name understandable. Make it easier and cheaper for your business by staying simple from the start. 6. Keep it simple – Your name should be descriptive, perhaps clever, but never confusing. 8. Now splash your name around on stall signs, business cards, web pages, facebook pages, or any sort of marketing tool. If you have picked a good name it will be something you will be proud to promote. 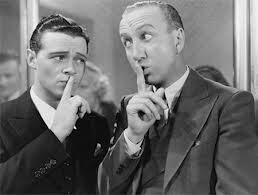 13/05/2013 15:59:14 Having a registered name "Dear Ed, I totally agree with the comments regarding the benefit of having a Name for your business, but under the listing of Trader's websites (Trader's Websites - (send us yours)) you tend not to use the business name. Regards Terry Lawn, Airllywood" Sorry Terry. Not sure why I left your business name out but fixed now. Any others? - Ed. As the war between online retailers heats up, ebay has introduced one hour delivery in select US cities. eBay has partnered up with big name retailers like Best Buy, Target and Macy’s and provides a “valet” to pick up the goods and deliver to you for a flat $5 fee. eBay employs the “valets” for now but intends hiring outside contractors down the track. This is eBays way of linking with bricks’n’mortar retailers. Meanwhile its subsidiary, PayPal, is rolling out payment facilities in over 250,000 US stores where users pay for goods by simply typing in their mobile phone number and PIN. Any war has its casualties and retailers who don’t meet the service standards offered by major players are likely to suffer. Service and convenience is the name of the game and whilst the type of service and its delivery will vary across the battlefield, doing things the old way is unlikely to be an option. QVM traders have the advantage of trading at the one site so organising co-ordinated delivery services would not be difficult. We already have food delivery services operating out of the market and a number of our traders use Australia Post for delivery anywhere in Australia. At least one of our traders offers free delivery on larger items. It may be time to think of how responsive your business is to consumer needs. 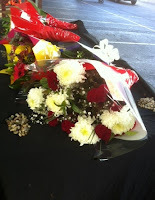 Trader's often find it difficult to express the depth of their feeling for The Queen Victoria Market. That depth of feeling is almost certainly not understood by most of management and probably only a few customers have it explained to them. A trader has commented on our post on Some Strange Decisions At QVM and very eloquently expressed a view that will resonate with the majority of Queen Victoria Market Traders. It deserves repeating here. "06/05/2013 19:18:19 Decisions decisions decisions - Yes, a fact that eludes many is that traders “own” their personal bit of the market not just in lieu of the rent they pay but more importantly due to the fact that the market only exists because men and women animate what is otherwise just a piece of extended dark, drab and dreary black bitumen. The market in turn truly “owns” the traders by demanding they give it a fair chunk of their lives. Past, present and future. A fact that our “owners” don’t seem too keen to dwell on for the obvious moral and ethical dilemmas that may arise when they make “boardroom” decisions. We, the traders, however cannot distance ourselves from those decisions and as a result take ownership of any and every decision that impacts on us, not because we want to usurp our guardians who have been entrusted to ensure the prosperity of the market, but because in many ways our lives truly do depend on it. And so it should not sound strange that at times some of us lie awake at night wondering what decisions have already been made or are about to be made that yes may add up on paper, but could have devastating effects on the future of the people that are in essence the Queen Victoria Market. So, if you're listening out there, please think hard and deep on your decisions." Consultation is an essential element in any management structure so when decisions come out of left field it is normal to question their purpose. Management’s last minute decision to extend the Suzuki Night Market season was unusual. The night market is well established and dates are pretty much locked in through various publications. So why suddenly extend it for a month? The introduction of night market food vendors into the day market (Sundays) was also a surprise. We now have a food festival of some sort in Queen St. every weekend. It should be noted that both these measures do create extra income for the market. The Elizabeth St. Market Office is to be closed shortly and traders will engage with the office through a back entrance. We are not sure how the public is to interact with market officials. We now learn that the Electrolux Cooking School has been closed. For a market that prides itself as a leader in food, that is a strange decision. Both these decisions will free up some prime retail space for rent so once again income may be a motivation. Management don’t have to tell traders the reasons for all their decisions although there is a view that they totally underestimate how much traders regard the market as their own. Traders earn their living at QVM and take a real interest in all aspects of its operation. The real worry about these decisions is not just their apparent haste, but that they smack of number crunching - a bit like giving a merchant banker freedom to determine cultural changes in an organisation. Or is that just paranoia from an interested trader? 06/05/2013 19:18:19 Decisions decisions decisions "Yes, a fact that eludes many is that traders “own” their personal bit of the market not just in lieu of the rent they pay but more importantly due to the fact that the market only exists because men and women animate what is otherwise just a piece of extended dark, drab and dreary black bitumen. 1. The Consumer Price Index rose 0.4% in the March quarter. 2. Queensland Government approves first Costco store in state. 3. Burger Kings first quarter earnings double after cost cutting measures. 4. ARA urges interest rate reduction in May Reserve Bank decision. 5. Amazon reports 22% earnings lift in first quarter. 6. Merrill Lynch predicts massive losses for Masters chain over next 4 years. 7. Australian auction company, Grays Online Australia, has purchased online department store, oo.com.au. 8. UK retailer, Primark, to compensate victims of Bangladeshi factory collapse. 9. Woolworths defends decision to buy Australian deodorant brands like Rexona and Impulse offshore. 10. US consumer confidence rises in April. 11. Officeworks opens 11 new stores in 11 months. 12. MYOB and Westpac launch new project to help small business go online. 13. Ikea set to open first stores in India. Are Our Trader Representatives Worth What We Are Not Paying Them? The QVM TAC (Traders Advisory Committee) has been reformed and has the structure to do things. But are there any results yet? Representatives have been keenly involved in many meetings and given pages of information to management on things like audience evaluations. But are there any results yet? It could be argued that these are early days and we know that there are many levels in the QVM decision making structure. However we appear to be marking time. We don’t even have a vision or mission statement in place. We haven’t set any goals, much less decide how to measure results. We haven’t tackled the real issue which is lack of business for traders and how we turn that around. Achieving a turnaround in business will require action by management. It will also require action by traders. What action? Isn’t it time we sat down and established achievable goals, what needs to be done to achieve those goals and how we measure the results? Your Trader Representatives are familiar with processes that get nowhere. The TAC was run that way for many years. We understand that the high level issues we are examining require funding and perhaps Tuesday’s State Budget will give us the good news we have been waiting for. But if the news isn’t good we still have to move forward and there are many things that can be achieved on small promotion budgets and real focus on the key issues. The answer to the question in our heading is “NO”. Trader Representatives are not worth what we are not paying them. Fortunately, that is not due to lack of desire by your representatives. It is just that the process is not yet focussed on getting results. Are we being impatient? Maybe a little. But let’s not forget it is traders who are losing financially, not the property owners or property managers. Traders have every right to expect a result focussed process. The horror of the garment factory collapse in Bangladesh has once again raised the question of ethical procurement and factory standards overseas. The same transparency that gives customers inside information on pricing also means they want to know if the shirt they are wearing was made in a safe environment. Amidst all the dubious claims of “environmentally friendly”, “ethical”, or “green” products there is room for some honest statements about the supply ethics of the products we all sell. "Fair Trade" is just one example of an ethical concept that has strong following. This week I emailed my supplier of Chinese made goods asking for such assurances. To be honest I don’t think he understood what I was asking. I certainly haven’t received a reply. I had better let him know I need an answer. This issue is not going to be solved quickly but it is not going to go away either. Renew Australia, a not-for-profit organisation, is attempting to turn empty retail and office space at Docklands into people places. With the support of Melbourne City Council, Places Victoria and MAB Corporation, creative types, including some retailers are being offered the keys for a weekly participation fee of just $20. Participants understand they can be kicked out at any time but free rent is a very positive aspect of starting up or relocating a new business. 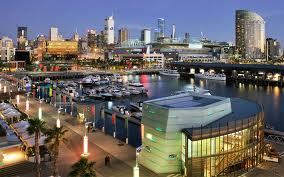 Docklands has more than 8000 residents and 30,000 workers to add to the mix. Four jumbo jets of clothing into Australia each week and one Australian customer every 6 seconds - these are just two of the staggering statistics claimed by UK online fashion retailer ASOS. ASOS launched its dedicated Australian website in September 2011 and opened a Sydney office soon after. Australia is the largest single market for the global fashion group which recorded a 40% increase in sales in the first half of 2012/13. International sales rose to $321m at a rate that eclipsed British sales growth.